Summer rain showers can be disturbing, but also very fun if you know how to get in touch with your playful side. Try to use your imagination and remember how it was when you were a kid playing outside in the rain. 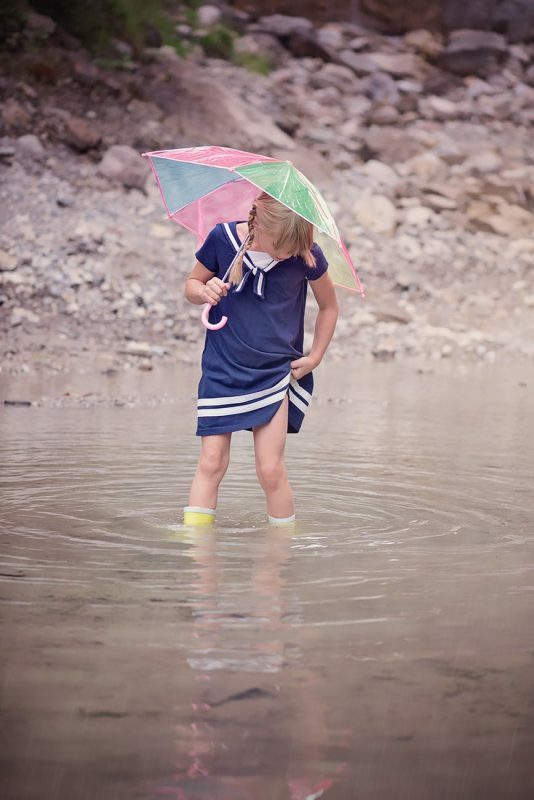 Be creative and think about all the fun things you can do in the rain now with your kids. If you’re lacking ideas, here are some useful tips that will help you enjoy rainy days more than you can imagine. Your kids will be endlessly happy and be proud to have the coolest mom or dad ever. Check out these ideas on how to entertain your children outdoors while it’s pouring. Show your kids that singing and dancing in the rain is fun and not scary. Provide rain boots, raincoats, and umbrellas for each member of the family and get out there for a private rain performance. Your kids will be amazed by your idea and will get to play as much as they want. 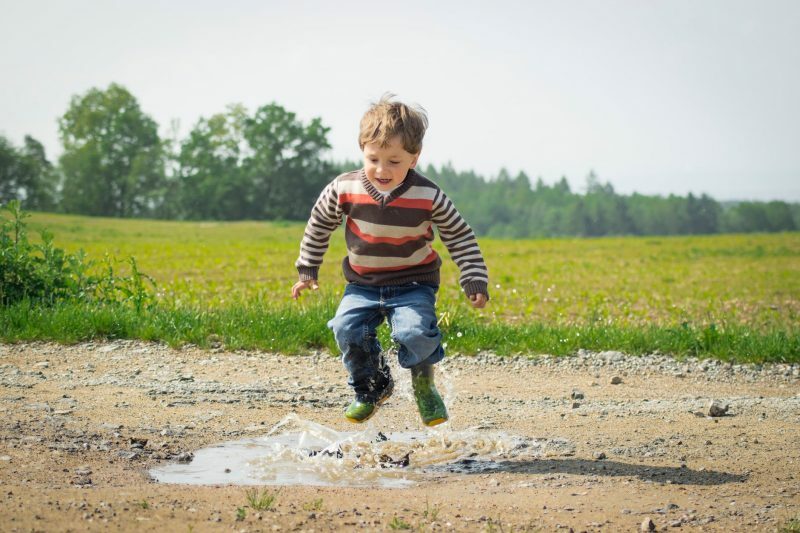 The earth gets soft and easy to dig when it rains, so grab this excellent opportunity to go out there and make mud pies. You imagine that you own a candy shop and make different types of “sweets” out of the mud, decorated with flowers, leaves, stones, and sticks. Kids love to cook and usually they always stay around the kitchen when somebody is cooking. Well, cooking with mud can be a great rain activity that will let your kids play and get dirty, as well as being creative. Water toys are awesome in the bathtub, but they are even better outside in the mud puddles. 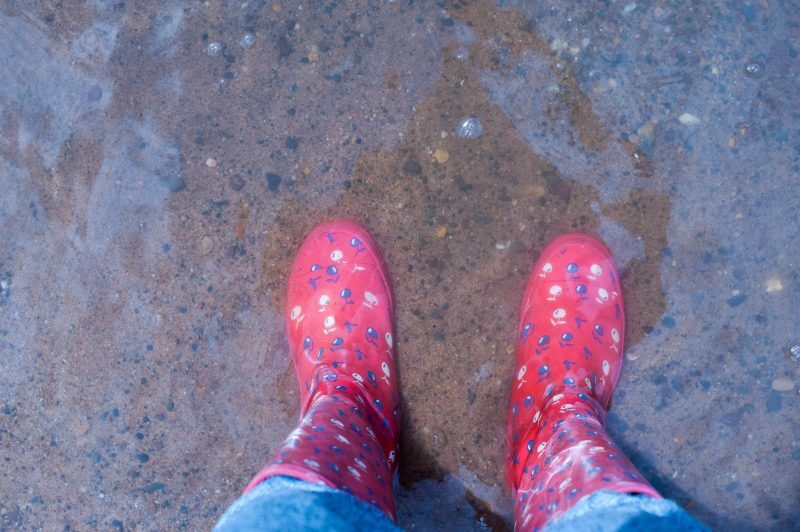 Tell your kids to take out their favorite water toys and let them swim in the puddles that are deep enough. It will be a whole new adventure for them and a real enjoyment for you watching their shiny, happy faces. 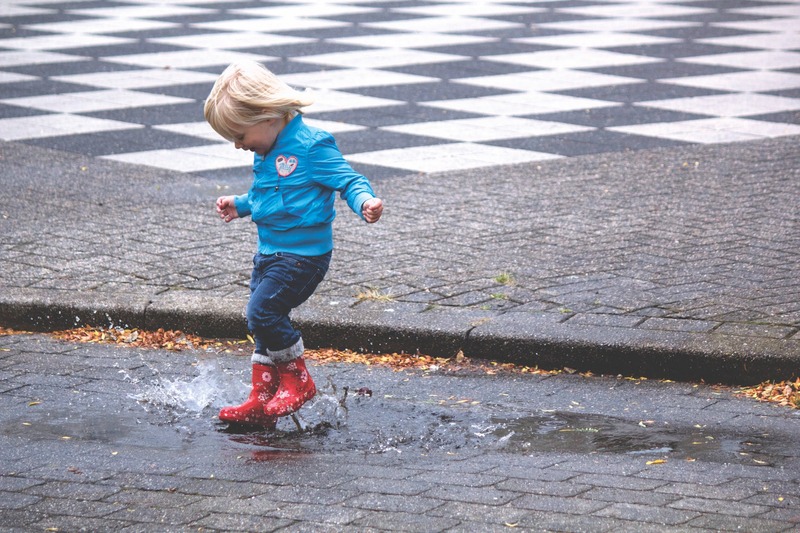 A rainy day is the best to teach your kids to observe nature and learn about their senses. Look at the raindrops, notice the direction, how it feels on the hand, how it smells and tastes. 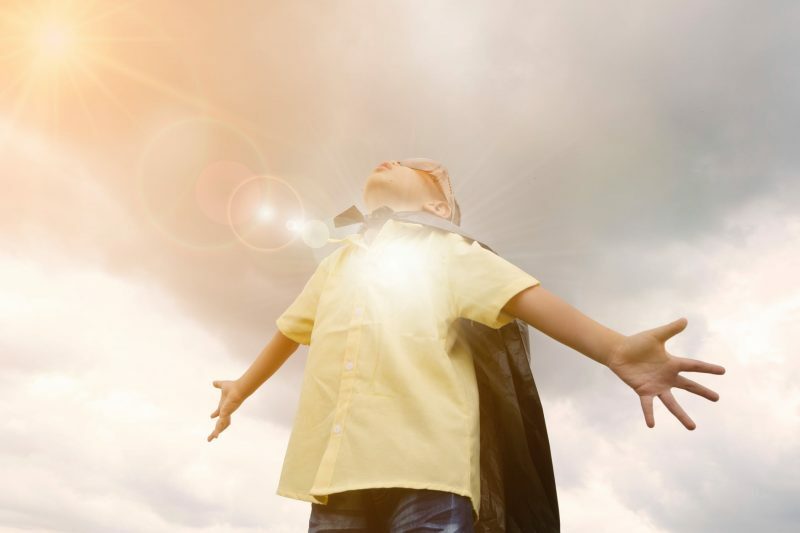 All of these things will help your kids become awake and aware of their surroundings and their senses. When you all get tired, go home and write everything down in the nature journal. Buy them simple notebooks with nature photo on the cover so they can write down every outdoor experience in there. This simple activity provokes giant smiles and there is no kid who doesn’t like to do it. Make sure to bring a waterproof camera, take some epic tongue-out shots of your kids, and frame them when you go back home. All in all, you can spend an entire day with this activity and all the crew will love it. Teach your kids not to be afraid to catch earthworms with their hands. When they realize that the worms are not scary and can’t bite, make sure you explain to them that all lives matter equally and it would be great if they help those worms survive the flood. Every time you see an earthworm drowning in a puddle, take it out of there and place it on moist earth. Also, keep an eye on worms that walk on sidewalks and move them to a safer ground. If your kids learn to respect earthworms, they will easily respect bigger animals and humans. Find a flat muddy surface, grab a stick and start drawing! All kids like to draw, and this new “technique” will keep them occupied for a while and make them feel like real painters. If you have two or more kids, organize a competition on whose drawing will last longer before the rain washes it away. Rain art is another activity that your kids will love. First, get some washable markers and make a drawing at home. Then put the drawing outside in the rain and watch the raindrops create a new work of art. Whenever your kids are satisfied with the new design, take the wet paper back inside and let it dry until the next day. Some of you will be interested in framing the rain art and keep it forever as a rainy day memory. Take out old pots, pans, glasses, and other kitchen gadgets, turn them upside down and place them in your garden. Let the raindrops fall on them, sit on the porch and enjoy the rain music. Let the little composers place the “instruments” the way they want and let them create the new rain-music masterpiece. Enjoy the raindrops and good luck!